We never quite made it to Computex - but VIAHardware.com did, and produced an excellent report focussing on Small Form Factor PCs and of course featuring the Mini-ITX platform. They have pictures of some great looking Shuttle products, including a very desirable SS51 packing a GeForce 4 Ti4600 punch. Soldam's EXE looks like it was recently discovered on the moon by scientists and started to emit a high-pitched radio signal toward Jupiter, and their other designs look equally intriguing. VIA had a colourful new reference case design, there's more information on the CLE266 chipset which may power future Mini-ITX designs, and some nice cases from Chyang Fun. 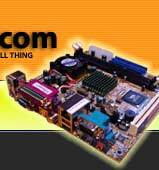 There are pictures of Mini-ITX motherboards of varying sizes from Lex and ACorp.